This list was created with limit holdem in mind. If you play no limit holdem, small pairs will definitely go up in value, as well as suited connectors. Please note the differences between “suited” and “off-suit”. They are off-suit as default unless otherwise noted. When you’re dealt Aces, Kings, or AK suited, you can and should raise and even re-raise before the flop, no matter your position. A pair of queens or jacks you have to be a bit more careful with, but the chances are still huge that you are top hand before the flop. Raise and drive out the draw hands, if there are no raises in front of you. Why are these strong? 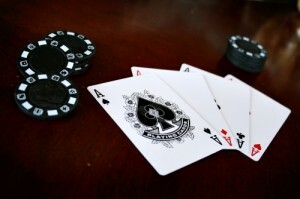 If you notice, all have strong flush or straight draw chances, as well as a high face card. The pairs of 10’s or 9’s have to be included simply because of the rarity of being dealt a pocket pair, and these being on the high end. With strong cards, look to raise in middle or late position, only if noone has raised before you. If you raise in middle position and someone in late position re-raises, be careful. If they’re a strong player they probably have you beat in card strength unless theyre bluffing to try and take the blinds and antes. Dont bother raising with these cards unless everyone in front of you has folded. Also be careful playing these in middle position. Honestly, you probably want to see the flop as cheaply as possible. These cards can turn into monster hands though, because of their deceptive value. If you have a reputation as a strong player, other players wont be expecting you to make a straight with a 9-8. Another reason to at least play these cards sometimes is to keep yourself from getting a reputation as a “Rock”. If you only play nut cards and everytime you raise, everyone else folds, you’re missing out on some big bucks. These cards have to have serious help from the board to win. If you can get to the flop cheap it can be worth it though, as these are draw hands to flushes and straights, and you may hit trips with your low pair. These cards can make good bluff hands when you’re “on the button,” and everyone in front of you has either folded or called the blinds, because they at least hold some potential for a good hand…so its not a complete bluff. But be warned. These are “play and pray” cards. In low limit games they might be worth it. But if you play these cards every time, you’ll see your chip stack sink fast.